One of the interesting benefits of the 3D printing revolution is the dramatic increase in availability of prosthetics for people with virtually any need. With a little bit of research, a 3D printer, and some trial and error, virtually anyone can build a prototype prosthetic to fit them specifically rather than spend thousands of dollars for one from a medical professional. [Dominick Scalise] is attempting to flesh out this idea with a prosthetic hand that he hopes will be a useful prosthetic in itself, but also a platform for others to build on or take ideas from. His hand is explained in great detail in a series of videos on YouTube. The idea that sets this prosthetic apart from others, however, is its impressive configurability while not relying on servos or other electronics to control the device. The wearer would use their other hand to set the dexterity hand up for whatever task they need to perform, and then perform that task. Its versatility is thanks to a unique style of locks and tensioners which allow the hand to be positioned in various ways, and then squeezed to operate the hand. It seems like a skilled user can configure the hand rapidly, although they must have a way to squeeze the hand to operate it, or someone will need to develop an interface of some sort for people without needing to squeeze it. To that end, the files for making your own hand are available on Thingiverse. [Dominick] hopes that his project will spark some collaboration and development, using this hand as a basis for building other low-cost 3D printed prosthetics. 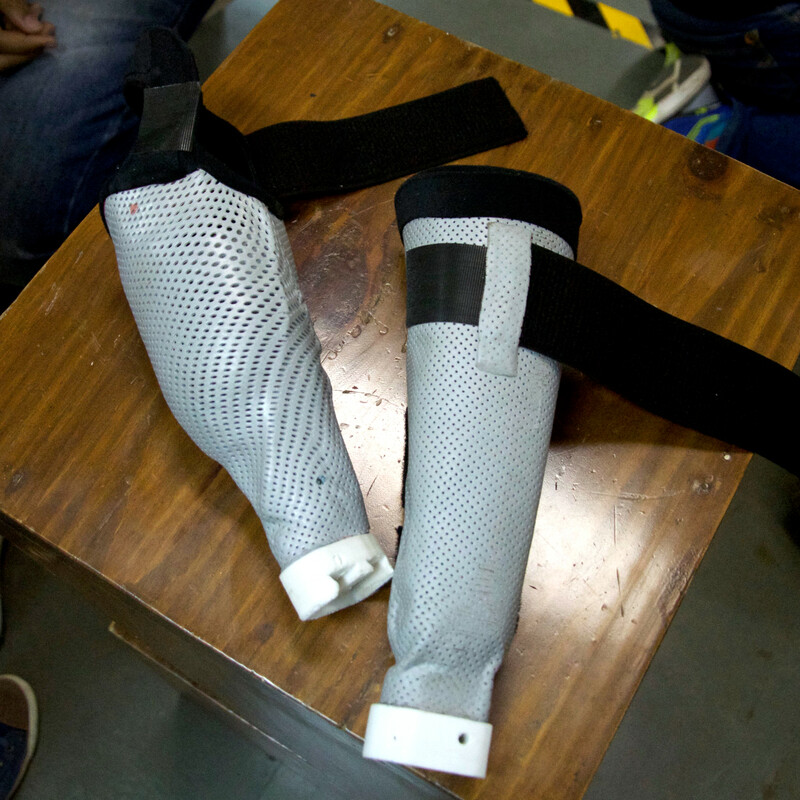 There are many good ideas from this project that could translate well into other areas of prosthetics, and putting it all out there will hopefully spur more growth in this area. We’ve already seen similar-looking hands that have different methods of actuation, and both projects could benefit from sharing ideas with each other. Thanks to [mmemetea] for the tip! The Internet overflows with prosthetics projects, and to a large extent this is somewhat understandable. Prosthetic devices are ultimately a custom made for each user, and 3D printers are trying to find a purpose. Put two and two together, and you’re going to get a few plastic limbs. The electronics required for advanced prosthetics are a bit harder than a 3D scanner and a printer. If you’re designing a robotic leg, you will need to pump several hundred watts through an actuator to move a human forward. For the last few years, [Jean-François Duval] has been working on this problem at the MIT Media Lab Biomechatronics group and has come up with his entry for the Hackaday Prize. It’s a motor and motor control system for wearable robotics that addresses the problems no other project has thought of yet. The goal of the FlexSEA isn’t to build prosthetics and wearable robotics – the goal is to build the electronics that drive these wearables. This means doing everything from driving motors, regulating power consumption, running control loops, and communicating with sensors. To accomplish this, [Jean-François] is using the BeagleBone Black, a Cypress PSoC, and an STM32F4, all very capable bits of hardware. So far, [Jean-François] has documented the hardware and the software for the current controller, and has a few demo videos of his hardware in action. You can check that out below. When [aimzzz] met this puppy born without arms, the need for some assistive hardware was obvious. We love it that rapid prototyping techniques have become so accessible that something like building a wheelchair for a puppy is not just affordable, but a lot of fun too! The main part of the projects is a cradle which will be comfortable for the dog. 3D printing is a great choice here because it can be customized to suit the needs of a particular dog. We remember seeing another dog named Derby who has 3D printed legs that make room for the biological legs that aren’t functioning correctly. In the case of this wheelchair, the cradle could be altered make room for legs. The rest of the build is purely mechanical. Aluminum tubing, tubing connectors, and wheels combine with the printed cradle (and some padding material) to make for one sweet ride. It takes a bit of training to get used to, but as you can see after the break this makes mobility quite easy and intuitive for the pup.